It is turning out to be a long joy ride for those who own shares of two-wheeler makers. Rising scooter and motorbike sales have been pushing up these stocks year after year. Annual two-wheeler sales have more than doubled from 72.49 lakh to 148 lakh between 2007-08 and 2013-14. Shares of Hero MotoCorp and TVS Motor Company have risen 317% and 589%, respectively, since October 2007. Bajaj Auto has risen 713% since May 2008. The five two- and three-wheeler companies that trade on India's exchanges have returned 80% this year till December 17. They had risen 7% last year. The good news is that it is not too late to add some two-wheeler stocks to your portfolio. Market experts believe the sector could give good returns in the next two-three years due to double-digit earnings growth. "Surge in consumer spending, fall in raw material prices, increase in commercial activities and the government's decision to extend the four percentage point cut in excise duty have boosted the segment. Fall in fuel prices and festive demand have also improved sentiment," says DK Aggarwal, chairman and managing director, SMC Investments and Advisors. "The scooter segment is likely to keep growing. We expect the 20% growth to continue for the next few years," says Ajay Shethiya, vice president, auto & auto ancillary, Centrum Broking. The demand for both two- and three-wheelers is expected to rise further if the economy revives. Recent reforms by the government have already given investors confidence. On December 17, the valuation of two- and three-wheeler companies was quite attractive. Most were trading below the industry price to earnings, or PE, ratio of 25.27. An exception was TVS Motor Company, trading at 40.65. "The government's "Make in India" push will create jobs and increase demand for vehicles. More jobs will improve incomes and drive demand for two-wheelers," says Aggarwal. Nikhil Kamath, director, trading and risk, Zerodha, an online brokerage, says, "We expect the rally to continue into the New Year as most of the industry looks reasonably valued." The segment is highly competitive. After their split, both Hero Motocorp and Honda of Japan have been aggressively launching new models. Then there are the formidable Bajaj Auto and TVS Motors, besides new entrants in the two-wheeler segment such as Mahindra & Mahindra. The industry faced a slowdown last financial year. Two-wheeler sales rose only 7% from 134 lakh units in 2012-13 to 148 lakh units in 2013-14. But the good part is that companies have been able to hold on to prices, keeping profitability intact. For financial year ended March 2014, Hero MotoCorp and TVS Motor Company registered net profits of Rs 2,109 crore (down 0.42% from Rs 2,118 crore in 2012-13) and Rs 183.94 crore (down 2.57% from Rs 188.8 crore), respectively. 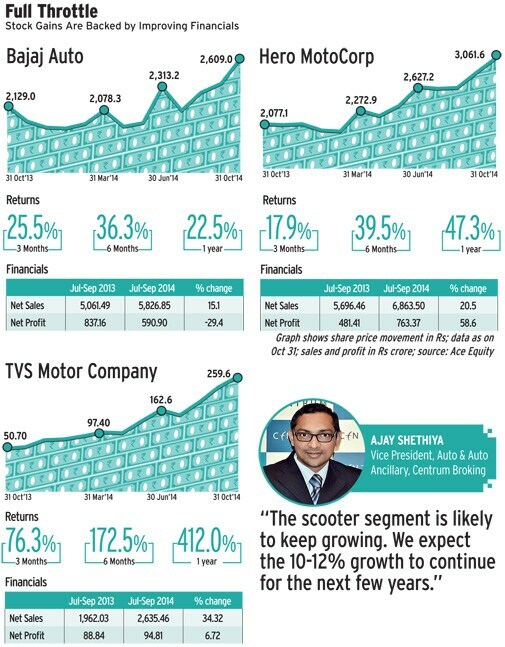 Experts are bullish on the three-wheeler segment too. "From here onwards, the three-wheeler industry is expected to remain strong given the grant of new permits and good replacement and export demand. We expect the three-wheeler industry to grow 8-10% a year over the next three years," says Bharat Gianani, senior research analyst, automobile, Angel Broking. "We expect 10-12% annual growth for the two-wheeler industry and 6-8% growth for the three-wheeler industry," says Shethiya of Centrum Broking. Factors that help demand are increase in incomes, lower oil prices and technological advancements. The negatives are labour trouble and commodity prices. High interest rates are still a concern as most purchases are made on loans. The Reserve Bank of India, or RBI, has kept rates high to control inflation. However, the recent decline in inflation may allow the RBI to cut rates. "The plus points are growth, rational pricing and asset-light business models. But the possibility of a price war among players to gain market share could have an adverse impact," says Shethiya. Hero MotoCorp: One out of 10 motorbikes sold globally is made by Hero, which also holds the distinction of being the second company in the world to have produced 50 million motorcycles. Hero has been increasing its scooter capacity too. The company registered a net profit of Rs 763.37 crore for quarter ended September, up 59% from Rs 481.41 crore in the corresponding quarter a year ago. Pawan Munjal, vice chairman and managing director, Hero MotoCorp, said on the sidelines of a recent Motilal Oswal Global Investor Conference that India has always been a scooter market and there has been a clear growth in demand. "Global business is an important part of Hero's strategy and we plan to go to 50 countries soon. We plan to invest Rs 2,500 crore in the near future. Our vision for 2020 is to increase revenue to $10 billion (10% from exports) and produce 12 million units." According to a Prabhudas Lilladher report, the Hero stock can touch Rs 3,134. The stock has given over 20% annual return in the past 10 years. It was trading at Rs 3,061 on October 31, a PE ratio of 25.42. Bajaj Auto: New product launches and export demand are expected to quicken the pace of revenue growth. The contribution from the export market is almost 50%. This is expected a rise on the back of expanding global footprint and improvement in demand. The stock rose 32% to Rs 2,458 in the one year to December 17. According to a Motilal Oswal Securities report issued in October, response to the recently-launched Discover 150 series has been encouraging. It expects good demand for the Discover brand. The outlook for exports (around 47% of net sales) continues to be bright. DK Aggarwal of SMC believes the stock can touch Rs 2,900 in the next 12 months. Gianani of Angel Broking says, "We prefer Bajaj Auto given the improved economic scenario, which will boost demand for premium bikes, where Bajaj is the market leader. It will also regain its domestic motorcycle market share on the back of new launches and double-digit growth in exports." TVS Motor Company: The company reported a net profit of Rs 94.81 crore in the quarter ended September 2014, up 6.72% from Rs 88.84 crore in the corresponding quarter a year ago. Net sales rose 34.32% to Rs 2,635.46 crore from Rs 1,962.03 crore during the period. Kamath of Zerodha is positive on the company. "Sales have been good over the last four-six quarters. Technically the stock has made an ascending triangle on daily charts and is breaking out of it; also, with the auto sector being as correlated to GDP as it is, the reforms the government is bringing in could drive this stock higher." Ascending triangle is a bullish chart pattern used in technical analysis that is easily recognisable by the distinct shape created by two trend lines. On December 17, the stock was at Rs 243.85.